Nba.com: Bol's cousin had spotted Manute's potential when he saw his picture in a newspaper. He told Bol he should use his height to play basketball. He first played basketball at age 18 and chipped his teeth on the rim when he first tried to dunk. In 1984, Bol came to the United States and played one season for the University of Bridgeport in Connecticut. His coach, Bruce Webster, says Bol had "the longest arms in the world. He could catch and turn and dunk." After Bridgeport, Bol joined the minor-league Rhode Island Gulls. While there, Bol twice blocked an unheard-of 18 shots in a game! In another, he had 28 rebounds! The Washington Bullets drafted Bol. His first season (1985-86), he led the NBA in blocked shots (4.96 per game). Bol bounced around the NBA. He was a master of relocating the shot and led the Washington Bullets, Philadelphia 76ers, Golden State Warriors and Miami Heat to many great seasons. When the Milwaukee Bucks cut him in 1995, he went back to the minor leagues. In 1997, Bol turned his attention to Sudan, where he was briefly Minister of Sports and Culture. The next year found him playing ball in Qatar. Bol spent five long years in Africa, dealing with VISA problems and political problems while living in Egypt. In a 1999 interview on NBC's "Dateline," Bol said he had given $3.5 million to rebels trying to overthrow Sudan's dictator. Now he supports peace. "I'm not supporting the Sudan government," he said. "I'm supporting the peace agreement. I want peace in my country." Currently, he makes celebrity appearances to earn money for his peace efforts. He lives in West Hartford Connecticut. IBN Facts: Manute Bol and Gheorge Muresan of Romania share the record of being the tallest players ever to play in the NBA both playing at 7 feet, 7 inches (2,31 metres). Bol as he was born the son of a Dinka tribal chief. 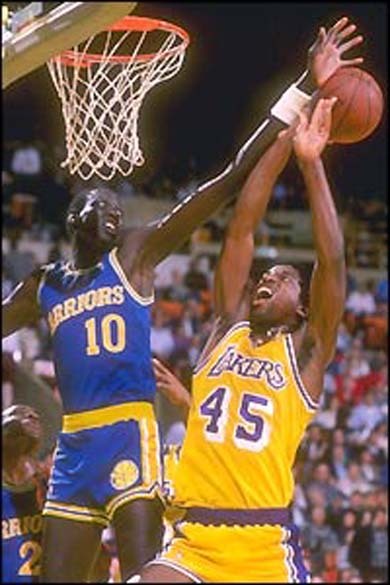 Manute didn't inherit his height from his genes as his father stood only 5'10" and his mother was 5'7". However there was something special about their union as Bol's younger sister is 6'10". IBN Notes: A Dinka tribesman who blocked shots and occasionally hit a three-pointer (or five), Manute used his celebrity and passion to try ending civil war in his native Sudan. So much so that he was named Minister of Sudanese Sports and Culture and to the point of exhausting all of his money.